This comprehensive text addresses a number of important issues. 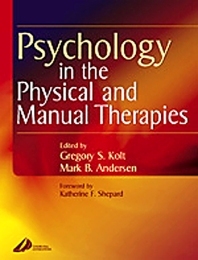 It features extensive coverage of psychological principles as they relate to illness, injury, and rehabilitation. It covers key concepts relevant to psychological care in physical therapies, with special focus on approaches to client care. This unique text also includes material on specific client populations. Easy-to-read style and format make the text a helpful reference for experienced practitioners brushing up, or for newcomers seeing a condition for the first time. Information effectively relates the theoretical and research foundation to the practicalities of client -practitioner relationships, interventions and working with clients with a variety of conditions. Broad international range of contributors provides diverse approaches, giving a global picture.